Here are a few tips on how to enjoy trick-or-treating safely if you and your kids live in an apartment complex. 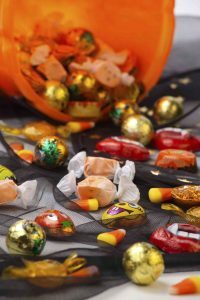 Although Halloween is often thought of as kids walking around their neighborhood from house to house for treats, kids living in apartment complexes can enjoy the holiday as well! In fact, they may even have a better situation, as they don’t have to walk around in the cold, without having to worry about bundling up and covering their costume. If you and your children live in an apartment complex, here are a few tips on how to enjoy trick-or-treating safely. Before Halloween night, try to talk to all of your neighbors in your complex to see who is participating and if other children want to walk around together as a group. This will let you get to know your neighbors if you don’t already know them, and you’ll know who is participating in the holiday. While it is common knowledge for house owners to turn their front lights off if they aren’t participating in the holiday, it’s a little different for apartments. If your apartment has a newsletter, ask to have an ad put in that tells all participants to leave their outside light on and decorate their door, so the kids know they are handing out candy. Once you know who is participating, you can plan a route based off of the apartments handing out treats. If you want to trick-or-treat at another complex, make sure you find safe pathways that won’t pass through parking lots or driveways. As always, you should be a flashlight when trick-or-treating at night, to ensure your children’s safety. The best costumes for your children are ones that are safe! The outfits should be flame-resistant, since the hallways and apartment complex may be filled with decorations such as Jack O’ Lanterns. Also, the costume shouldn’t be too long so that they won’t trip over their outfits or any wires on the floor. Lastly, try not to choose a costume with weapons as props. Not only could this send a wrong message, but as your child has to hold the prop and his or her bag of candy, they won’t be able to hold on to you. This also makes it much more likely for a small child to drop things throughout the night. This entry was posted on Monday, October 30th, 2017	at 12:30 pm	. Both comments and pings are currently closed.